This space saving Twin Loft bed is the perfect solution for any kids room. Features Twin Size Bed , Built in Computer Desk, two Bookshelves and an angled Ladder. Finished in Rich Espresso color and is made out of Solid Wood and Veneer. 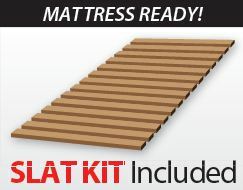 Includes mattress support slat kit. Weight Capacity for top Bunk is 140-150lbs. $120 Set-up charge applies when selected. Installation is available for orders delivered within the 5 boroughs of NYC and Nassau County; parts of Suffolk County, New Jersey and Connecticut. Please contact us to confirm whether installation is available in your area BEFORE placing your order. Orders delivered via Freight are not eligible for installation.